Are you ready for some epic 3D dirt bike adventures? In this sports game you will travel to the forests to perform some fun jumps and overcome some extreme obstacles. 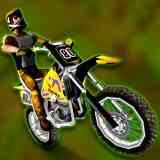 Spin yourself into the air in this great fun, pro free trial bike styled game. The aim of the game is to ride through the beautiful green forests into the winter levels packed with snow and ice to progress to the next level. You choose the way you want to pass the level, you can perform it by racing through the level performing the perfect stunt or simply by taking your time and going at your own speed. 20 levels packed with more and more challenging obstacles to give you the feel of a real challenge never encountered in this life before or by other games. There's never been a sport like it! - Realistic Physics. - 20 Beautifully designed levels. - Insane obstacles to overcome.